The aroma of freshly baked bread has filled our rural homestead following the early French settlers introducing their ovens that made breads from wheat on the Great Northern Peninsula. Large families kept women particularly busy in the kitchen. I’ve heard many stories from my grandparents how their mother would mix a bread and prepare many loaves. 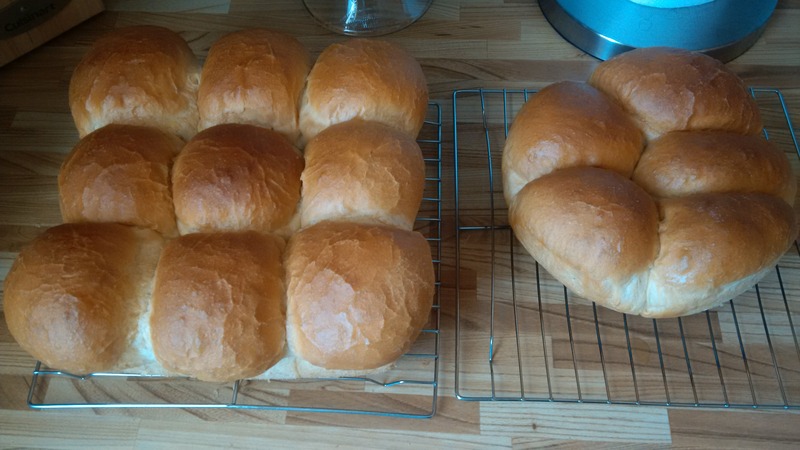 Freshly baked homemade bread was a fixture growing up. However, it seems to be a traditional that is less practiced with more and more people purchasing breads and rolls from grocery stores. My mother made bread recently, her first is a very long time and it was truly delicious. I remember when I was younger she always used a small metal jam dish to make me a little “Tommy” bread, which was essentially I small bun or roll. We enjoyed the homemade bread with a large serving of homemade baked beans and a scoop of turnip hash. My mouth waters every time I see this picture. Keeping tradition alive on the GNP! 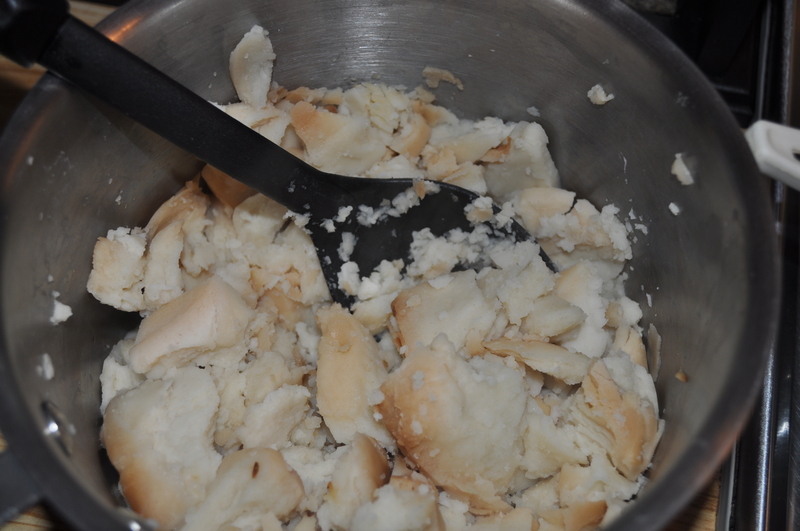 Purity Factories continue to provide me with the Hard Bread (Hard Tack) that I need to make a meal of delicious brewis. Most of us have beloved memories of foods that are the heart and soul of our upbringing – Purity Factories does just that for many Newfoundlanders & Labradorians. This company continues to provide the staple foods demanded by locals, which includes a diet of Jam Jams, Syrups, Hard Bread and more. It was such a relief when the lock-out ended and the company started producing again. Before Christmas there was no hard tack to be found anywhere. If other bakeries did not consider making the stuff, I could only imagine the rioting that may have happened in the streets. 🙂 Well maybe that is a little far-fetched, but Newfoundlanders & Labradorians feel a close connection with Purity Hard Bread. It truly is part of our traditions, passed on from generation to generation. There are times when I get a craving for the foodstuff that is uniquely ours. 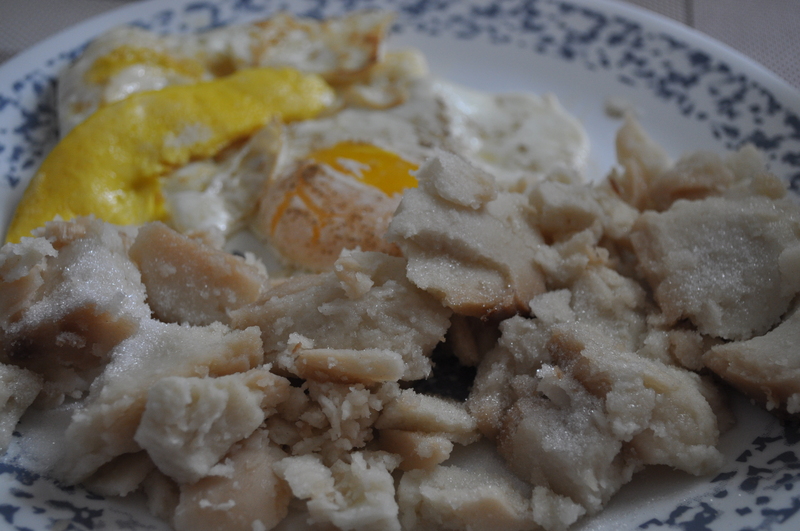 Last night, the hard bread was soaking in preparation for brewis in time for noon, which we refer to as dinner, not lunch. I love the fluffy stuff with a bit of sugar sprinkled on top, served up with a couple of eggs. It is a real treat! My mother made the comment, “wondering why local restaurants do not promote this and have brewis and eggs on the menu for breakfast and dinner?” It seems like a good idea to me. Maybe a local restaurant will add this traditional delicacy to their menu or maybe one already has it, if so, please let me know and I will update this post. We have an opportunity for a rural food revolution, to have culinary experiences and foodstuffs on menus that are not found elsewhere. We have a history that spans 50 centuries, with so much to offer. The Great Northern Peninsula can be a great place for some good grub. In previous posts, I have mentioned the highly talented baking skills of my Grandmother Pearl and the delicious squashberry jam she prepared. 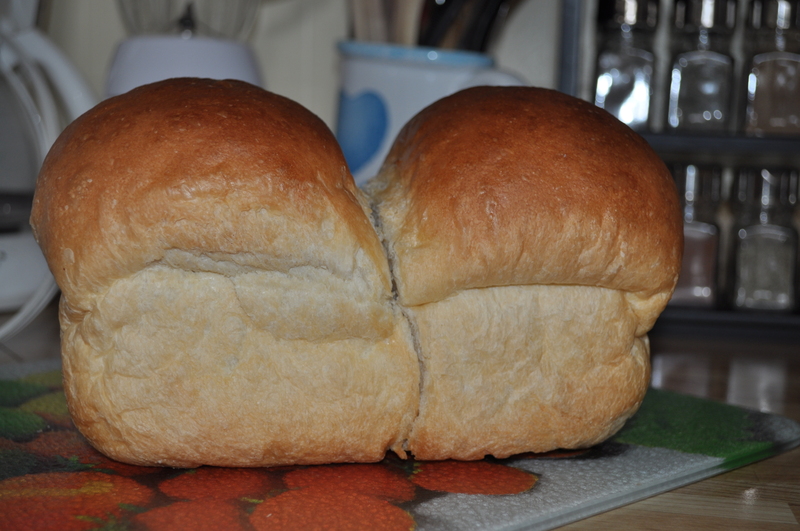 On Monday, I dropped by her house and was greeted by the pleasant smell of freshly baked homemade bread. We had a wonderful conversation over a steeping hot cup of coffee and tea at the kitchen table, as we peered out the window at the setting sun over the Strait of Belle Isle. I remembered as a child picking blackberries on the barrens near the ocean in her backyard. I would bring them in for her to make me the most delicious blackberry puddings. It would be a real compliment with Sunday’s Dinner. My grandmother is still very youthful and community-minded. She is actively involved with the 50+ Club, Lionness Group, Church Group and many more organizations. She gets involved with fundraising activities, attends socials and at the time was icing a cake to bring to a grieving family in the community. I only hope to stay as active as she is when I reach her youthful age. We talked about several challenges for small non-profits and noted some action that may be taken to bridge some gaps. It was a wonderful visit. I do not do it often enough and must make a greater effort to do so more often. My Grandmother gave me one of her freshly baked loaves of bread. It was a treat with my supper meal. If you have the opportunity, take some time to visit a loved one. If you can, enjoy that cup of tea or freshly sliced piece of homemade bread.